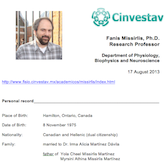 Graduate of the National School of Biological Sciences of the Instituto Politécnico Nacional; provides research assistance to various projects. Responsible for the maintenance of the fly stocks. Provides secretarial assistance to the laboratory. My scientific interests span many questions in the biology of metals. They are described in these pages and explored through collaborations with students and colleagues around the world. Graduate of Biology (1997) University of Patras. Max-Planck für biophysikalische Chemie in Göttingen, Germany. Fellow of the Higher Education Academy of the UK (2012).